Celebrating the life of Peter Pedro Jr.
Be the first to share your favorite memory, photo or story of Peter . This memorial page is dedicated for family, friends and future generations to celebrate the life of their loved one. Obituary for Peter Pedro Jr.
Gunnery Sergeant, Peter Pedro Jr, USMC, Ret., 82, of Irvine, California, succumbed to cancer in the comfort of his home surrounded by his family on November 9th, 2018. Peter is survived by his wife Wanda of Irvine, California; along with 4 children; Sam Pedro of Molokai, Hawaii, Lorianne Haunani Johnson, of Irvine, California, Robert Pedro, Army, Ret., of Molokai, Hawaii, and Michael Pedro of Rancho Santa Margarita, California. Peter is also survived by his siblings, Joe Pedro, Sam Pedro and Cissy Pedro of Molokai Hawaii. Peter was furthermore blessed with 10 grandchildren and 4 great grandchildren who all adorned him and called upon him in their own special ways as Tutu, Grandpa or Papa. 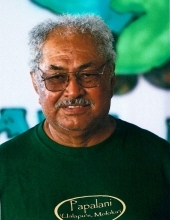 Peter was born in 1935 in Molokai Hawaii and shortly after graduating high school Peter began his career in the Marines. GY SGT Pedro, then spent the next 22 years defending the county he loved with 2 tours of Vietnam in 1963 and 1964-1965. After retiring from the Marines, Peter spent the following 20 years working for Southern California Edison. Peter’s retirement years were spent doing what he loved, riding his Harley with the American Dresser Association, or bringing home fallen soldiers with the Patriot Guard Riders. If Peter was not on his Harley you would most likely see him in the kitchen cooking for his loved ones or for anyone that stopped by to “talk story”. To plant a tree in memory of Peter Pedro Jr., please visit our Tribute Store. "Email Address" would like to share the life celebration of Peter Pedro Jr.. Click on the "link" to go to share a favorite memory or leave a condolence message for the family.